Daphne Rubin-Vega in Empanada Loca. Photo by Monique Carboni. BOTTOM LINE: A dark solo show about revenge and meat pies, Empanada Loca is Sweeney Todd in Washington Heights. Lights up on a decrepit bunker, far below the subway tracks. Dolores (Daphne Rubin-Vega) introduces us to her digs. She's quite comfortable, with her rigged electricity and massage table bed. She doesn't interact with the "others" who inhabit the subway tunnels, and she's rather lonely as a result. So she's glad for this chance to talk. Dolores explains everything, starting from the beginning, about how she ended up here, far away from the bustling life above ground. And what a story it is. From a college student with promise to a convicted drug dealer taking the fall for her boyfriend, Dolores's downward spiral resulted in 13 years behind bars. Once out, she tried to reconnect with the boyfriend, only to find him gone and herself alone. That is, until she stopped by an old neighborhood joint, Empanada Loca, and reconnected with the restaurant's proprietor, her old friend Luis. Written and directed by Aaron Mark, Empanada Loca chronicles Dolores's post-prison journey. It's to the credit of both Mark's enticing writing and Rubin-Vega's engaging portrayal that the show remains incredibly exciting throughout. This rather lengthy solo show (95 minutes, Rubin-Vega on stage throughout) never feels like the marathon it must be if you're the one performing it. But it must also be a ton of fun. 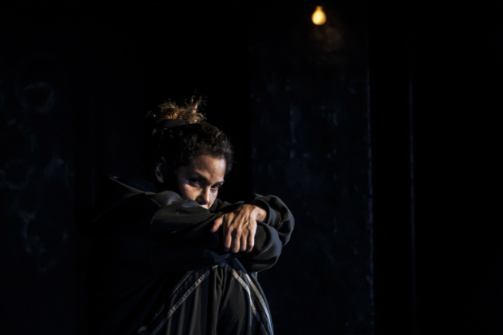 Rubin-Vega imbues tough Dolores with an unexpected optimism that makes the audience hope for the best, even though we know that the worst must be to come (or else Dolores wouldn't be living a lonely life off the grid). And sure enough, things do go horribly wrong. As Dolores gets comfortable living with Luis, she seeks to reclaim her changed neighborhood from the unfriendly stoop dwellers, Columbia students now inhabiting her old apartment, and neighbors who are suspicious of her intentions given her drug-dealing past. When Dolores opens a massage parlor in Luis's apartment—using skills she honed in prison—she realizes how much trust is put directly into her hands. What is at first an impromptu revenge strategy becomes a business model (this is where the Sweeney Todd inspiration comes in), and let's just say everyone loves the new empanada flavor with the unidentified meat. The subject matter here is deliciously unsettling, and Rubin-Vega's genial delivery makes it all the more disturbing. Although her behavior is unfathomable, she definitely does seem like a bit of a victim herself. The play's final moments—a fun twist that would be mean to give away here—add a fun extra layer of theatrical icky-ness. Though Empanada Loca is a solo show involving stories from the past, the production feels very present. Rubin-Vega is a captivating performer and it's a treat to watch her delve into Dolores and all her quirks in such an intimate venue. Mark has fun teasing the audience along the way, and although the story could be a much shorter one-act play or even a sketch, the longer format allows for a more vivid portrayal of Dolores's circumstances. The decrepit tunnel in which Dolores lives (set design by David Meyer) is perfectly discomforting. Bradley King's lights and Ryan Rumery's sound evoke a mystery that keeps the tension alive. Empanada Loca is a delicious treat, and perfect for the season. Mark and team have created a production from which you can't hardly look away. Not that you'd want to anyway. Empanada Loca is written and directed by Aaron Mark and produced by Labyrinth Theater Company. Set design is by David Meyer. Lighting design is by Bradley King. Sound design is by Ryan Rumery. Sean Gorski is the production manager. Lily Perlmutter is the production stage manager.